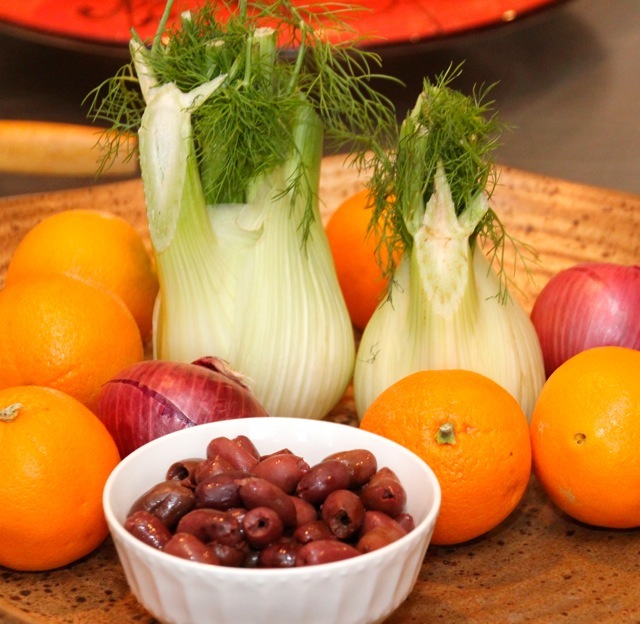 Another recipe we prepared at a Lark Inn Cooking Class is the Orange, Fennel, Red Onion and Black Olive Salad. This is one of those “Ah-Ha” recipes. What do I mean by that? Well, if you ask people whether or not they like fennel, probably 80% will tell you they don’t . . . and about 80% of them have never tasted it! I can’t tell you how many times I have prepared this and people have thanked me for opening their taste horizons to fennel. 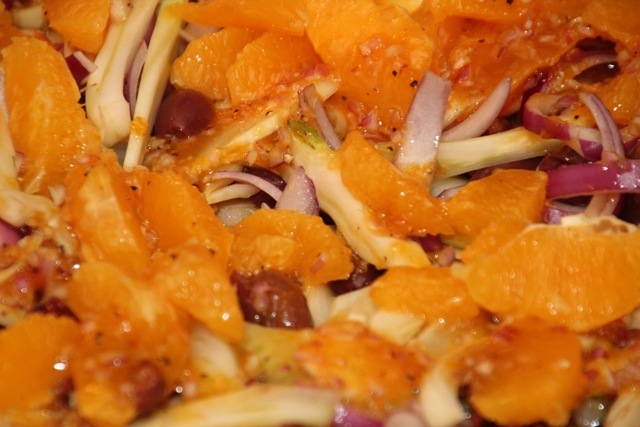 With the contrasting flavors of the anise in the fennel, the sweet tang of the oranges and the pop of the red onion, this is a great refreshing salad for any time of year and will compliment most any food. USING A SHARP KNIFE, CUT ALONG THE MEMBRANES OF EACH ORANGE SEGMENT TO COMPLETELY REMOVE THE ORANGE SEGMENTS FROM THE PITH AND MEMBRANES. PLACE IN A BOWL AND RESERVE ANY ACCUMULATED JUICES SEPARATELY. 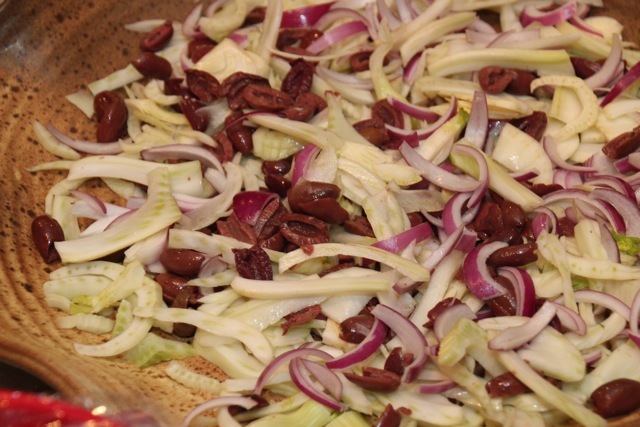 PLACE THE FENNEL, RED ONION AND BLACK OLIVES IN A SALAD BOWL AND CHILL THOROUGHLY. PLACE THE ORANGE JUICE AND ORANGE ZEST IN A SMALL SAUCEPAN AND BRING TO A BOIL. CONTINUE TO COOK AT A SIMMER UNTIL REDUCED TO ABOUT ¼ CUP (BE CAREFUL NEAR THE END OF COOKING, AS THIS CAN EASILY BURN IF LEFT UNATTENDED.) ALLOW TO COOL, THEN TRANSFER TO A MIXING BOWL ALONG WITH THE RED WINE VINEGAR, SHALLOTS, HONEY, SALT, AND PEPPER. WHISK TO THOROUGHLY COMBINE AND ALLOW TO SIT FOR 5 MINUTES. ADD THE OIL IN A THIN, STEADY STREAM UNTIL COMPLETELY INCORPORATED AND EMULSIFIED. 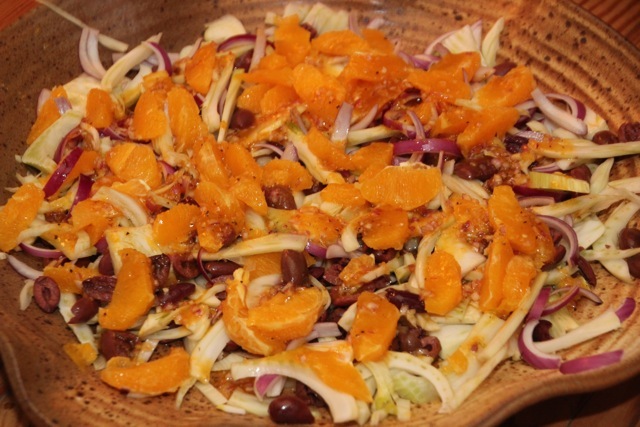 ARRANGE THE ORANGE SEGMENTS OVER THE FENNEL, RED ONION, AND OLIVES AND DRIZZLE WITH THE VINAIGRETTE. TOSS GENTLY TO COMBINE, THEN SERVE THE SALAD, WITH SOME OF THE RESERVED FENNEL FRONDS ON TOP AS A GARNISH AND DRIZZLE WITH EXTRA OLIVE OIL IF DESIRED. For more information about my Cooking Classes at The Lark Inn or great Get-A-Way accommodations in the Picturesque Flint Hills of Kansas please visit our website at: www.TheLarkInn.com.